Christmas is one of the biggest holidays in the archipelago. Philippines celebrates the longest Christmas season in Asia with 90% of most Filipinos are Christians and 80% are Catholic. This is the time where families and friends unite. You can hear Christmas carols as early as September and usually lasts until the Feast of the Black Nazarene on January 9. The church observe this season and formally start the celebrations from the beginning of Simbang Gabi or Misa de Gallo on December 16 until the Feast of the Epiphany or Feast of the Three Kings on the first Sunday of the year. Simbang Gabi is a way of thanksgiving, worship, petition or simply fulfilling someone’s wish for it to come true (as they say). In urban areas like Metro Manila, most offices organize parties and are usually held during the second week of December, right before schools and universities go on holiday. Most schools organize Christmas Party, and common activities includes Kris Kringle or Monito/Monita; there also are parlor games that they do in order to push with the celebration. Food is provided through potluck, or through money contributions to buy food. One Christmas traditions that’s very common to Filipinos is the Christmas trees. Another is the parol or lantern which symbolizes Buddha’s power to disperse and to disrupt the power of evil and darkness. Christmas decorations are glamorous and catches eyes of people who observe them. 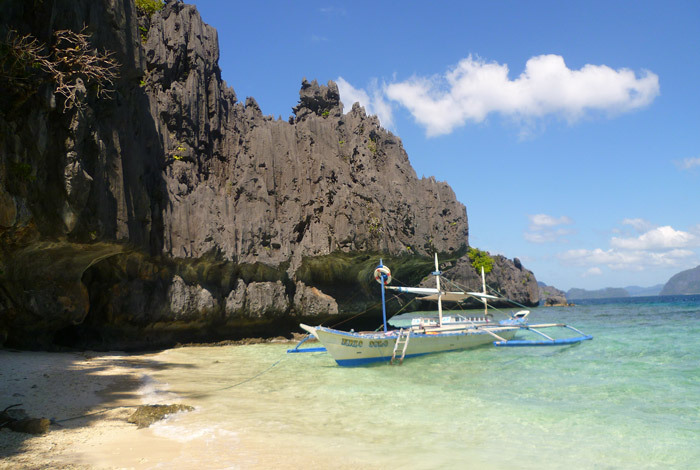 Located in the western provincial island of Palawan. It is a popular tourist city with many perfect beach resorts, natural wonders and great seafood restaurants. It has been acclaimed as the cleanest and greenest city in the Philippines. It is a truly great spot for families who plans to celebrate Christmas and New Year away from civilization. This island is surely a paradise you will enjoy during Christmas break. It is a perfect place to get away from urban jungles. Most of their crowds are single, and couples who enjoys night life and big crowds. Its primary tourist attraction are its coral white sandy beaches of which Alona Beach has. Panglao is known for snorkeling and diving sites like Arco Point, Kalipayan, Napaling and Puntod. Compare to Boracay , Pangao has less night life and it also has less crowds. A perfect Christmas destination. . The Church of Our Lady of the Immaculate Conception in Baclayon is the second oldest church and is made of coral stonework. The stones were reportedly cemented together with the whites of a million eggs. Another good place to visit is the Tarsier Sanctuary in the town of Corella. Perhaps Chocolate Hills is the most famous site in Bohol with a unique geological formation of more than 1700 mound-like hills spread over a 20 square mile area. During Christmas holidays, most people prefer spending their vacation in Baguio to experience cold temperature. Aside from being the “Summer Capital of the Philippines”, this is also often considered as the “Winter Capital of the Philippines”. It also have many places to visit which includes the Botanical Garden, the Asin Hotspring, Burnham Park, Rice Terraces, etc. You will also enjoy their sidewalk bazaars and flea markets without spending too much. The second largest city in the Philippines next to Metro Manila. It is also called the Queen City of the South which can offer iconic churches that can be visited during Christmas season. You will also enjoy the view of the giant Christmas tree in Fuente Circle, where colorful lights are light up every night throughout Christmas, New Year and up to the Sinulog Festival. Aside from their hotels, you will also enjoy their beaches. If you want to experience winter Christmas you can visit the northernmost province of the country situated in Cagayan Valley region. Batanes as they say is so beautiful, though it would costs more than the other destinations. They also have numerous hotels where you can stay during the Christmas break. Batanes is also known for its Arius trees or the Batanes Pine which they use as Christmas trees and decorate it with Christmas lights. Another place where to spend Christmas to is the Puerto Galera, a small city on the North Coast of Mindoro Island. If you are fond of scuba diving and snorkeling this place suits you. Aside from that, you can go trekking in the jungle or the volcano. It doesn’t necessarily matter where you spend your Christmas eve and Christmas day itself; it does not really matter how much you have spent. You can always find your own go to place to make your Christmas season a simple yet meaningful one. What does matter is that the true and essential meaning of Christmas still lies dormant and excited in our hearts and the thought of remembering Jesus Christ himself – that is what the most definite and meaningful Christmas thought you can give yourself. Jollibee Commercials: Bida ang “Sawi”? Is Your Partner the Right One for You?